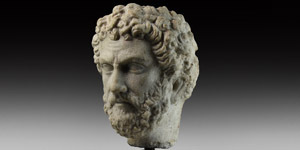 The head of Emperor Antoninus Pius captured in marble; the stern features framed by a full head of curly tousled hair covering the ears and a neat beard and moustache; the brow slightly furrowed with arched eyebrows and small lentoid eyes, short nose with broad nostrils, small mouth; the rear of the head with drilled sockets and lateral ledge to accept fixing pegs or clamps; possibly from North Africa; mounted on a custom-made stand. 13 kg, 37cm including stand (14 1/2" including stand). Very fine condition. Property of a central London gallery; acquired from a private English collection in 1977; previously in the Thompson family collection, January 1971; formerly with Samuel Josefowitz 1964-1971; acquired from the Adler family collection, Lausanne, Switzerland acquired before 1952; supplied with geologic report No. TL005196, by geologic consultant Dr R. L. Bonewitz..
Emperor Titus Aelius Hadrianus Antoninus Augustus Pius (known to history as Antoninus Pius) was Roman emperor from 138 to 161 AD. Of senatorial-ranking stock, Antoninus served under the Emperor Hadrian in a variety of important roles; Hadrian so favoured him that he adopted Antoninus shortly before his death. 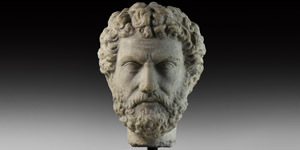 Antoninus was a prudent ruler who created a large fiscal surplus which he was able to leave to his successors, and was known for charitable acts such as commuting death sentences and freeing slaves. The cognomen 'Pius' (pious, conforming to religious custom) was applied to him after he took the purple - possibly because he forced the Senate to accept the posthumous deification of Hadrian. His tenure as Emperor is known for the peaceful state of the Empire, without major revolts or military campaigns. He managed to rule the Empire without ever leaving Italy. Under his guidance, a successful military campaign in Britain resulted in the construction of the eponymous Antonine Wall.